The Presidency Council’s Presidential Guard, which was signed into being at the end of August, is to begin recruiting in earnest next week, its commander said today. 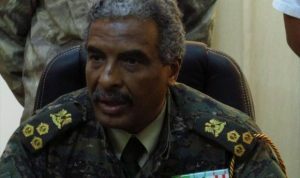 Colonel Najmi Ramadan Khair Al-Nakua, in his first interview with the media, said that priority would be given to recruits who had fought against terrorists and therefore had combat experience. Nakua’s annoucement came just three days after the UN Security Council had been told by UNSMIL chief Martin Kobler, that the Presidential Guard was a key part of the restoration of security. Once the Guard had been established, said Kobler in New York, the way would be open for the PC to request the partial lifting on the international arms embargo to let the Guard arm and equip itself. Few details have emerged of the strength of the new unit nor how would-be recruits are being vetted. Nakua has two deputies, colonels Mohamed Abu Bakr Laqri and Ibrahm Ahmed Abdullah Bilad who are both senior army officers. He said that the chosen recruits would be put through a period of extensive training. He also made a point of insisting that the Guard existed to support the army and the police and not to be a substitute for them. In New York on Tuesday, the UN had been told that the key functions of the Guard were to protect the government and state institutions as well as foreign embassies.